Which of these two highfliers should you be putting your money on? Micron Technology (NASDAQ:MU) and NVIDIA (NASDAQ:NVDA) are showing no signs of slowing down. The semiconductor specialists are going from strength to strength with each passing quarter thanks to a slew of catalysts, including video gaming and data centers, which have boosted their top and bottom lines by big margins. Not surprisingly, both chipmakers have beaten the NASDAQ-100 Technology Sector Index quite handsomely this year as well. It is quite likely that NVIDIA and Micron won't be running out of steam anytime soon thanks to the solid demand for their chips. This can make it difficult for investors to make a choice between the two stocks. As such, it may be best for investors to take a look at the potential risks facing these companies, as that can make it easier to choose. 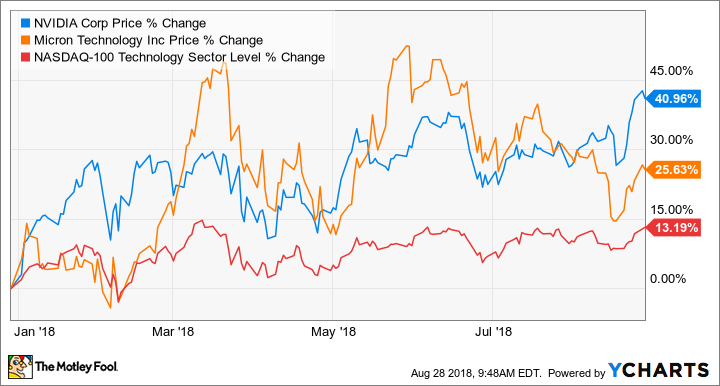 The market has shown signs of skepticism about Micron's ability to sustain its terrific growth because of the company's reliance on cyclical memory prices. DRAMeXchange, which tracks the prices of the dynamic random access memory (DRAM) and NAND flash memory that Micron deals in, estimates that memory prices will start trending lower from the end of 2018. That would bring an end to nine consecutive quarters of DRAM price growth. But what's even more alarming is DRAMeXchange's forecast that the price could drop between 15% and 25% next year as new supply comes online. Micron gets nearly 70% of its total revenue by selling DRAM, so this could be a major concern for the company since strong DRAM prices have been the foundation of its high-flying performance. DRAM prices shot up 76% last year, according to DRAMeXchange, and the rate of growth is expected to slow down to 30% in 2018 before prices drop off a cliff next year. If that indeed happens, Micron will be in for really tough times. But Micron could escape a potential memory oversupply, as DRAM demand is being driven by new applications such as cloud computing and artificial intelligence. For instance, the company's DRAM and NAND revenue from cloud computing sales shot up 33% and 24%, respectively, during the third quarter. The good thing is that cloud-related spending is expected to double in the next three years, so demand for Micron's memory products should continue rising. The growth of self-driving cars will be another tailwind for Micron, as these vehicles require faster data processing to make real-time decisions, pushing up demand for the company's DRAM solutions. But it remains to be seen when these catalysts will actually kick in to support memory demand, so investors need to tread with caution. Any oversupply in the memory industry could knock the wind out of Micron's sails. Unlike Micron, NVIDIA doesn't have a major headache to deal with, as its latest quarterly results show. The company's revenue and net income shot up remarkably once again last quarter despite a drop in sales to cryptocurrency miners, which came in at just $18 million compared to NVIDIA's original expectation of $100 million. Still, the rapid growth in NVIDIA's video gaming cards business and data center sales was more than enough to cover for this drop, as the company's revenue rose 40% annually and net income jumped 89%. The video gaming business, which supplies almost 58% of the company's total revenue, was up 52% year over year, while data center sales were up 82%. These two businesses together account for 82% of NVIDIA's total sales, and they look well-placed to sustain their impressive growth rates, for numerous reasons. Video gaming, for instance, will benefit from an increase in demand for PC gaming hardware. According to Digi-Capital, PC gaming hardware sales are expected to increase from $30 billion to $35 billion this year to $45 billion in 2022. NVIDIA commands nearly two-thirds of the discrete GPU market, so it is in a prime position to benefit from an increase in sales of gaming-centric graphics cards. Moreover, 35% of the company's installed user base is currently on older generation graphics cards that will become obsolete as more resource-hungry games hit the market. As such, NVIDIA's largest business has sustainable catalysts that should ensure its long-term growth. Meanwhile, the data center market is turning out to be another important catalyst for NVIDIA. Its Tesla graphics processors are in strong demand thanks to their ability to tackle artificial-intelligence-related workloads in the cloud. Google Cloud, for instance, recently added the Tesla P4 GPU to allow users to accelerate machine learning use cases such as video recommendations and visual searches. The AI market is still in its nascent growth phase, and it is expected to take off exponentially in the future. As such, demand for NVIDIA's GPUs in the data center space will keep growing. In all, Gartner estimates that sales of discrete GPUs will increase from nearly $7 billion last year to almost $11 billion in 2022, which is great news for NVIDIA given its stronghold over this space. Micron is much cheaper than NVIDIA from a valuation perspective. The memory specialist has a trailing price-to-earnings (P/E) ratio of just 5, compared to NVIDIA's rich trailing P/E of nearly 40. But the problem with Micron is its reliance on memory price cycles, as discussed earlier. If DRAM prices nose-dive next year because of oversupply, Micron could be in a lot of trouble, as it has been in the past. As such, NVIDIA looks like a safer bet in this case because of its industry-leading position in graphics cards, despite its expensive valuation. It enjoys greater control over the demand-supply forces in the GPU space, which is set to expand in the long run thanks to data center and gaming demand.